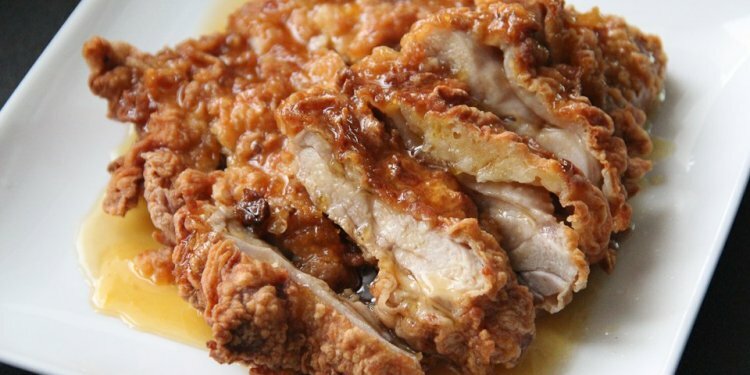 This recipe teaches you how to create super crispy chicken in the oven in the shortest time, with a scrumptious lemon sauce to perfect the dish. The only problem with my favorite crispy wing recipe is that the cooking process was slightly long for a weekday evening. When I was craving some wings, it just seemed like it took forever to get those wings ready. That’s when I started to search for another route to crispy wings. I wanted to use minimal time and effort to create rich, flavorful, and crispy wings. Like these crispy salt and pepper baked wings. I used the same ol’ trick from Asian cooking – baking powder. When you dust the meat with baking powder, it browns the surface much faster and creates a beautiful char. I also did a very brief brining session with soy sauce and sugar. It made the wings so flavorful that I could devour a whole plate of them, even without any sauce. It also kept the wings from drying out and added a beautiful color. That’s it! The whole baking process takes just 30 minutes. You can either marinate the wings in the fridge overnight, or do a brief marinade while heating up the oven. The result is this: perfectly browned wings that are crispy on the surface and juicy inside. I made a simple lemon garlic sauce to go with the wings, to take the dish from delicious to perfect. I baked 30 wings. Thomas and I finished them all within 20 minutes. And we were hungry for more! Quick tip – To serve the wings, I personally prefer to serve the sauce separately instead of tossing the wings with it. This way you can prevent the wings from getting soggy. For different sauce ideas, you can also serve the wings with a Korean BBQ sauce, or a honey sriracha dip. Or read this roundup of 15 chicken wings for more inspiration! Do you like my recipes? our weekly newsletter to get the latest updates delivered to your inbox and a FREE e-cookbook that contains my top 30 most popular recipes! Combine chicken wings and all the ingredients for the marinade in a large ziplock bag. Massage a few times to cover the wings evenly with liquid. Squeeze out as much air as possible. Let marinate in room temperature for at least 30 minutes, or in the fridge overnight. Line a large baking sheet with aluminum foil. Place a baking rack on top. Spray a thin layer of oil on the rack to prevent from sticking. Align wings on the rack, skin side up, with some space in between. Grind salt onto the wings. Flip and grind salt on the other side. (Optional) Line another baking sheet with aluminum foil, spray with oil. Arrange asparagus on top. Season with salt and pepper. Place wings on the middle rack and the asparagus on the lower rack. Bake at 220 degrees C (450 F) for 20 minutes. Turn on broiler. Flip the wings and bake for another 10 to 15 minutes, or until the surface is charred. While baking the wings, prepare the lemon glaze. Heat oil in a small sauce pan until warm. Add garlic and ginger. Cook and stir until fragrant. Add lemon juice, cider vinegar, lemon zest, and honey. Cook until simmering. Whisk potato starch with 4 tablespoons water until fully dissolved. Swirl into the sauce. Stir to mix well and remove the saucepan from stove. When the chicken wings and asparagus are ready, remove them from the oven and let cool for 5 minutes.